Do you have any examples of human characters that you've drawn? Before a non-human character is accepted, we like to make sure you have basic average human anatomy nailed down too. Either showing that in your intro comic or here in the forum is acceptable. I'll be including a human as a height reference on the finished ref sheet. Not sure if this will count for you guys, but here's a drawing I did in September 2015. 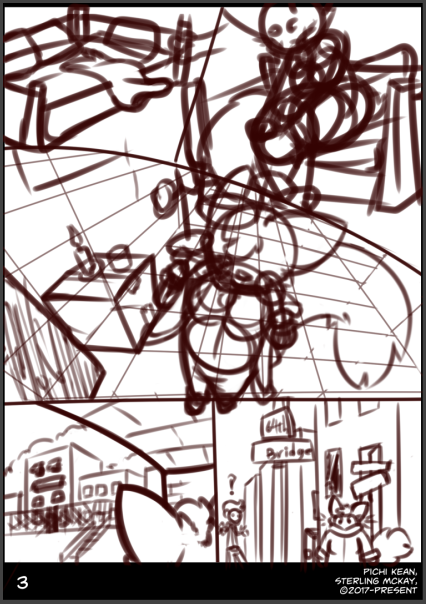 Finished the rough sketch of page 3! Time to rebuild Page 1 and 2 to fit the page size. 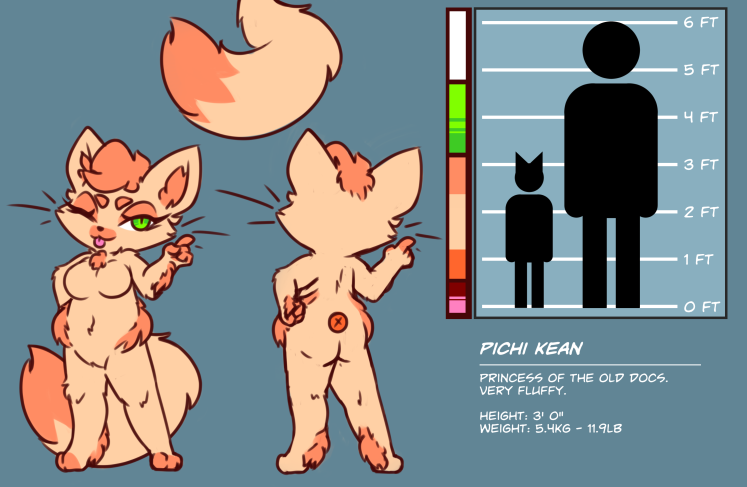 I'm getting Pichi Kean back up to speed and I'm going to be submitting her in by the end of the month! Anyway. To start things rolling again, I'm going to post in the character information I have. 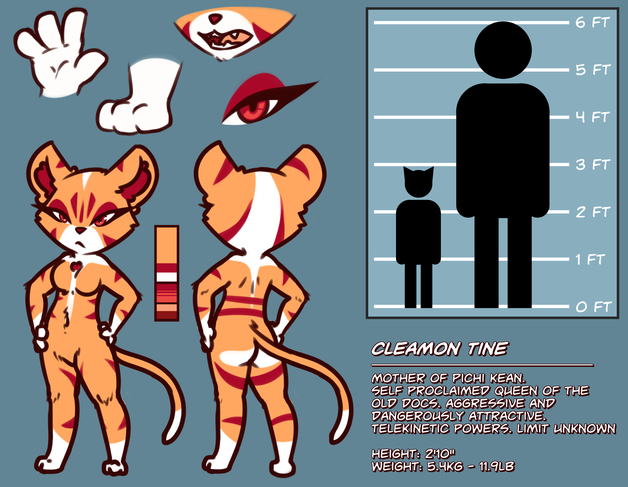 As you can see, Pichi's ref sheet is not quite finished. I have a few things left to do with it, but it's pretty close to ready. That ref looks pretty good, though when doing the ref for submission you may want to Pichi Kean on top since people may think that top design is the character they would be drawing. Other than that it looks pretty complete, hows the intro pages looking? As for the intro comic, The dialogue has been finalized, I still only have the last page 100% complete, but I'll start working on the rest of them again some time this week. Here's page 1 and 2 in their final layout sketch/semi detail sketch states. Page 3 needs to be completely redone to fit with the script. I... I can't... Not read that as if it's being spoken by your icon. Nice sketches dude! 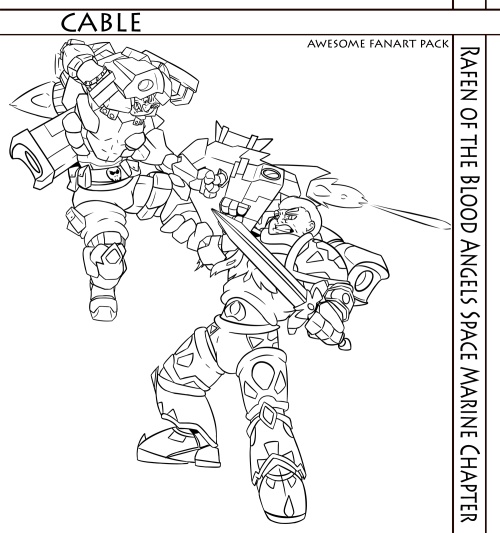 I hope you don't mind me just throwing some stuff out from what I've seen in these wips? Mainly, some zoomed out shots would be nice? Because aside from theee fifth panel of page one, there's really no fullbody shots of the characters demonstrated here nor will the reader get a good view of the environment they're in. 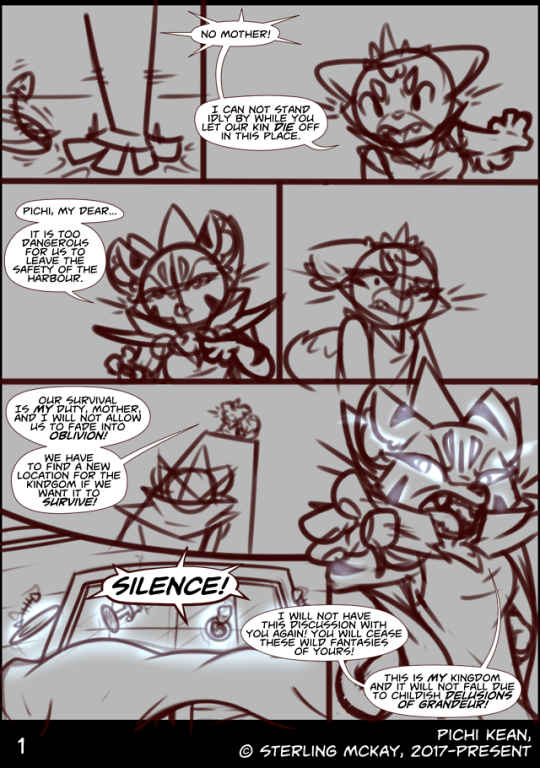 And also, when I first looked at these wips the first thing I noticed was the amount of speechbubbles that are crossing several panels when they don't have to. Especially in the last two panels of page 1, it's hard to stay focused on the supposedly intense visuals (Even /if/ they're sketches) when the lengthy speech bubbles cut right into it. The 2 speechbubbles in page 2 (Panel 2 and Panel 3) that cut into other panels as well, it confused me as to how I'm supposed to be reading the page, which panel is the next one. And this could be solved by zooming out and/or rearranging the panels composition. The 2 speechbubbles in page 2 (Panel 2 and Panel 3) that cut into other panels as well, it confused me as to how I'm supposed to be reading the page, which panel is the next one. And this could be solved by zooming out and/or rearranging the panels composition. As for page 1, again, bubble positioning could use a little tweaking before final. But generally, I'm happy with how Page 1 is set up. It's kind of meant to impose a sense of tension. Which is why I've chosen to keep the shots either close to the characters, or at strange semi-tilted angles. As it goes from page 1 to page 4, the angles become more relaxed and inclusive of the whole area. Just wondering how this sounds, if there's anything I can make sound better. 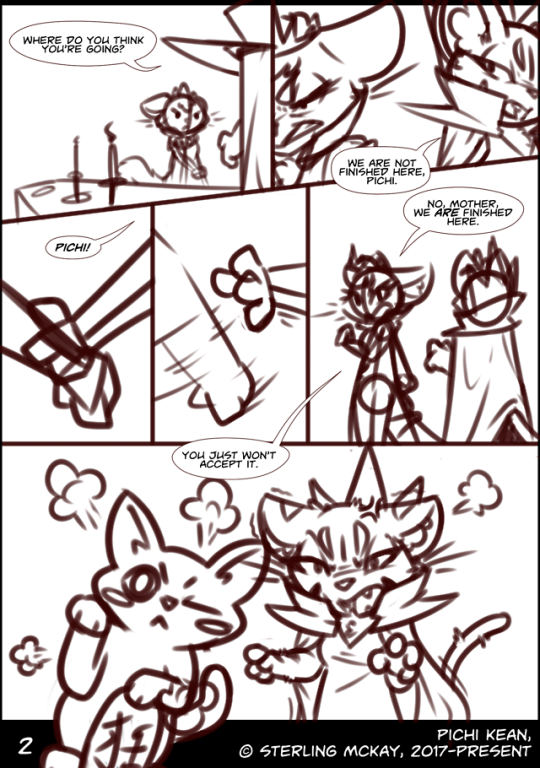 Since page 3 is currently the page that's not yet been re-sketched, there's chance to design it much better. The current script that's posted here is already the redesigned page script, so it's generally what I'm looking for. I just want to know if it can be improved in some way. See previous pages for context. All I could say is maybe a couple of those panels could be combined in terms of dialogue like panels 3+ 4 could be one panel of a dynamic shot of her putting on a coat as she walks out also separating the final 3 panels make the dialogue sound awkward just think of those taking the same time as the time between other panels and speaking it with that time gap sounds a tiny bit weird. But honestly that's a bit pedantic and there are no crippling story issues you need to worry about, Its a good cohesive story and we get to see the characters motivation for why they end up at void. However overall I will say the story is the least important part of the intro, so long as your panels are organized right and the font you are using is readable and bubbles decent you should be set. The intro is mainly a showcase of all the technical skills that you can consistently draw a character and backgrounds, I think you may also need a more humanoid character in the intro just to show you can do humans. But I think you could just make the butler that and be set.